Disability Law and Policy: An Analysis of the UN Convention undertakes a multidisciplinary examination of the United Nations Convention on the Rights of Persons with Disabilities. The rights-based perspective on disability is a relatively new lens through which disability law and policy is considered. This is despite the fact that persons with disabilities are often described as the world's largest minority. There are approximately 1 billion persons with disabilities in the world (15% of the world's population). 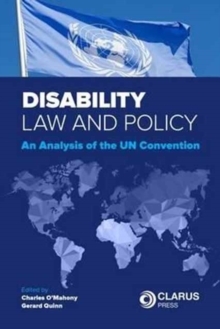 This book is an edited volume of essays that undertakes a multidisciplinary examination of the United Nations Convention on the Rights of Persons with Disabilities. Part 1 focuses on disability and intersectionality. Part 2 addresses the on-going debate about the meaning of Article 12, the right to equal recognition before the law. The chapters contained in Part 3 address the emerging discourse on the right to liberty as contained in Article 14 of the CRPD and the barriers facing persons with mental health problems. Part 4 of this collection examines the right to live independently and to be included in the community. The themes of the right to inclusive education and employment for persons with disabilities are explored in Parts 5 and 6 of the collection.